Bullying in schools is not the tip of the iceberg, it is part of ' what lies beneath'. The real tip of the iceberg is the increased level of violence that appears to be happening across society, across the world - road rage, trolley rage, queue rage, levels of assault, increased levels of domestic violence. Bullying is the precursor to this epidemic. 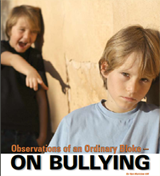 How bullying is dealt with in its early stages will have a long-term impact on society. There is plenty of talk but little action. Bullying is different things to different people, but if an initial description and standardized policy is agreed upon, the issue can be dealt with together. There are some good anti-bullying strategies available and in many schools. Some suggestions for school include counselling and enrollment into programs to deal with their behaviour (perhaps programs that the whole year group can be involved in). For example, emotional management, relationships, conflict resolution and life skills, aligned with curriculum. When dealing with those who are the target of bullying and harassment, it is necessary to be mindful that victims are not given assistance in the development of an impact statement. Protecting them at school may be possible, but not in the broader community, and this may set them up to be victims elsewhere. Building resilience in these people is critical in their long-term ability to deal with similar issues. It would be beneficial to encourage the philosophy of Victim, Survivor, Thriver - The Journey. Ken Marslew has been working in the area of positive behaviour change for over a decade. 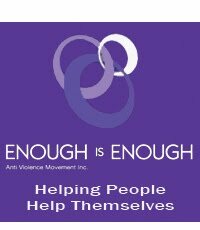 Following the murder of his son Michael in 1994, he formed the organisation Enough is Enough Anti Violence Movement Inc. Ken Marslew's pragmatic approach to dealing with change sees his programs in over twenty correctional centres across NSW, working with men, women and juveniles. He also runs programs for behaviourally challneged students in high and primary schools NSW. For more information about EIE anti bullying programs in schools, the content and availability, please visit our School Programs Page.